Nassib Lahoud , head of the Democratic Renewal Movement and one of the main pillars of March 14 alliance passed away Thursday after a long illness. He was 68. Lahoud passed away at dawn at Hotel Dieu Hospital in Ashrafieh, Beirut. A funeral will be held for him Saturday at St. Georges Cathedral in downtown Beirut . President Michel Suleiman expressed his deepest condolences and said he had a lost a friend. “I lost a dear friend who was key in forming the first government of my presidential term, and remained a close adviser afterwards,” Suleiman added. Lahoud held various political posts including Ambassador to the USA, Member of Parliament and Minister of State. He has also been at various times, a serious presidential contender. Lahoud was born in Baabdat – Matn, Lebanon, but was educated and spent a large portion of his life in the United Kingdom. After finishing his engineering studies, he founded Lahoud Engineering Co. Ltd. (in the early 1970s); the company’s activities are mostly the construction of large-scale power and heavy industry plants. His backstage participation in the Taif conference in Saudi Arabia, which ended the destructive Lebanese civil war, made him ambassador to the United States of America, where he enjoyed high-level relationships with leading U.S politicians. In 1991, he returned to Lebanon and was appointed Maronite Christian parliamentarian of the Metn region. He was later re-elected in organized legislative elections in 1992, 1996 and in 2000. From the beginning of his political life, he situated himself in the opposition to the pro-Syrian governments that ruled the country. He opposed the economic policies of the late prime-minister Rafik Hariri and Syrian interference in the Lebanese political scene. He voted against the constitutional amendments imposed by Syria to extend the mandates of presidents Elias Hrawi (in 1995) and Emile Lahoud (in 2004). In 2001, he joined the Qornet Shehwan Gathering, regrouping prominent Christian opposition figures under the patronage of Maronite Patriarch Nasrallah Boutros Sfeir. He was a prominent figure of the anti-Syrian opposition movement that started to organize itself after the extension of the pro-Syrian president Emile Lahoud’s term and which gained more political weight following the assassination of Rafik Hariri on 14 February 2005. Since 1995, Nassib Lahoud was considered to be the most serious candidate for the presidency. Despite his defeat in the last parliamentary elections, he announced that he was prepared to run for president if the March 14 Alliance that holds a majority in parliament since the last elections backs him. His willingness to run for the presidency is part of a wider campaign to remove the pro-Syrian president Emile Lahoud (Nassib’s cousin) who is widely considered to be the last bastion of Syrian hegemony over the country. 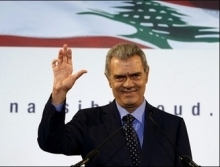 In 2008, the parliamentary majority designated Lahoud as its presidential nominee but the Hezbollah-led opposition refused to attend a legislative session to elect a new president, thus ensuring there was no quorum. President Michel Suleiman was later elected by consensus, after Hezbollah supporters attacked majority-affiliated buildings in Beirut, in a show of force reminiscent of the days of the Lebanese civil war. This was due to a refusal by the government to rescind two controversial executive decrees that aimed to dismantle Hezbollah’s private telecommunications system as well as sack the military general responsible for airport security. Nassib Lahoud was later appointed as Minister of State, as the representative of the Ex-Qornet Shehwan Gathering, in the first government under President Michel Suleiman mandate. Lahoud is survived by his wife Abla Festoq and their two children Salim and Joumana. President Michel Suleiman was later elected by consensus.